Maryse: Okay… you guys are gonna be mad. LOL! 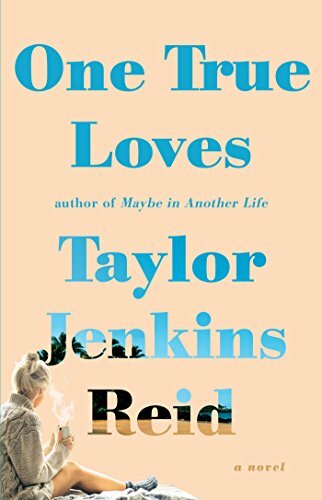 It’s the upcoming one by Taylor Jenkins Reid (One True Loves)… and it’s only coming out in June so I am WAY early with reading this, but I can’t help it. I CAN’T. THIS is what I’m in the mood for. !!!! Fabi: Maryse, June? June?! Really? Ugh. lol Enjoy! I am totally the same when I’m in the mood for a particular book, nothing else will do. Maryse: *rubs ointment on Amy’s nose* Amy… I know you have an awesome concealer for that. Amy: Oooooh Maryse, I do! Urban Decay Naked Skin Weightless concealer. It’s AMAZING. Not cakey at all but gives great coverage. And lookie here… *holds out iPad with both hands and wiggles it* I’m reading a TJR book too so nanny-nanny-boo-boo!!! By the way, it’s Maybe in Another Life. R. Renee: I don’t hardly ever give 5 stars unless the writer’s name starts with Taylor and ends with Reid. Dana: I love Taylor Jenkins Reid. Lisa: Maryse I love a good old school paperback read….kindle’s just don’t smell the same *winks*. I KNOW IT!! Even though y’all know I’m not a huge “paper book” reader, anymore. I was… once upon a time. And then the awesomeness of e-books was invented, and I could pretty much read, hands-free, highlight my favorite parts with the magic of my own finger, make notes all throughout the book without marring it, and of course, pick up where I left off without loosing my “bookmark” (which I seem to do regularly with a paperback, especially when the book and I snuggle all night when I’ve accidentally fallen asleep with it, still open in my hands… and then it inevitably closes, to get more comfortable 😉 ). Tee hee! It’s a really amazing exploration of… What if…? What if you found the love of your life? What if… after years and years together, you still knew you were the only ones for the other? What if you get married and have the perfect life together. That successful life, that both of you have dreamed of together. What if one of you dies in a plane crash? What if it almost kills you to lose the only one you think you could ever love like that? The world seemed so dark and bleak and meaningless. Life seemed so pointless, so cruel. I thought of how Jesse took care of me and how he held me. I thought of how he felt when he ran his hands down my back, how his breath smelled sweet and human. I lost hope and love and all of my kindness. I told my mom that wanted to die. I said it even though I knew it would hurt her to hear it. I had to say it because of how much it hurt to feel it. What if the other mourns for years, and finally begins picking up the pieces and slowly but surely begins living again, maybe… even falling in love again. After Sam and I started dating, I noticed my laugh lines were getting deeper. This is most likely because I am growing older, but I can’t shake the feeling that it’s because I’m laughing more than I ever have. What else could you want in a person, other than kindness and humor. I’m not sure anything else really matters to me. And what if the dead spouse comes back… because he was never dead at all? The man I loved since I was seventeen years old. The man that left me a widow when his helicopter had gone down somewhere over the Pacific ad he was gone without a trace. And now you’re both lost. Actually… all three of you are lost. What if? Sam is my new life. My new, beautiful, wonderful, magical life. but what can one do when the past collides with the future? When the past was SUPPOSED to be the future? I feel awful for giving up on Jesse. For thinking he was dead. For moving on. For falling in love with someone else. I’m actually furious at myself for that. But I’m also really angry at myself for not being loyal to Sam, for not remaining steadfast and true in my devotion, like I have promised him I would be. I am mad at myself for being unsure, for not being the sort of woman that can tell him he’s the only one, for not giving him the kind of love he deserves. I’m mad at myself for a lot of things. OMG YES. It was believably gut-churning. Heart-wrenching, and deeply moving. Trying to find herself in her old life, while trying to reconcile it all with her new life. HER. LIFE. My dreams, the rope, and the knots, I know exactly what they mean. You don’t tie yourself to something unless you’re scared you might float away. And that’s really as much as I can tell you, my angst-loving romance reading friends. The rest if for you to explore, because yes… she definitely chooses. This heartbreaking love story is complete, and the reality of that choice is front row and center. Somebody loses. Maybe even her. I guess it depends on how you experience this book. But the “feeling” is in experiencing it for yourselves. Piece by piece. Moment by moment. Thought after thought. Heartbreak after heartbreak. Relief after elation. READ IT! It’s awesome, and you’ll be into it. It’s her unique brand of “love story” in all of it’s angsty glory. Hmm. Haven’t read her yet. Maybe…. But, the heroine might lose and she is exhausting? OMG woman! I came on here to blast you (with all love and affection, of course :P) for always doing this when a new TJR book comes out (it was probably just one time, but still) but now you have me so choked up that I can’t even do that! GAH! This one is going to beat the sh!t out of my heart, I can already tell. But er… not whodunnit. Maybe more like… whowillit? be. Whoa. Did you just play the Sherlock card? With out watching Sherlock? Oh god, I’m choked up already and it’s only the review, albeit an awesome review. 😉 This book is going to tear me up! Maybe Maryse is messing with us. Instead of it being tear your heart out its more along the lines of My favorite Wife. Like the author rewrote it with the wife being the Cary Grant character. I’ll probably read it when Amy & Maryse watch an ep of Sherlock. Now I don’t know whether I can’t wait to read it, because I absolutely LOVED Forever, Interrupted, or put it on my “Books I Am Afraid to Read” because I HATE love triangles. On a side note, (kind of, sort of related) did anyone ever watch the series finale of The Medium? When her hubby’s plane went down and they thought he was dead? And she tracked him down and found him somewhere without his memory? And then the twist that came? D**n I cried a lot that episode! I haven’t watched that Jeannie, but it sounds AWESOME!!! YAY! This book is right up my ally!